Next month, Wonder Woman will make her big-screen debut in Batman v. Superman: Dawn of Justice. But today, Princess Diana is the star of the season finale of DC Super Hero Girls. And we have your exclusive sneak peak! In case you haven't heard of DC Super Hero Girls, it features some of DC Comics' most iconic characters in a new kind of adventure: high school. It follows Wonder Woman, Harley Quinn, Poison Ivy, Batgirl, Katana, Supergirl, and Bumblebee as they fight bad guys, keep the world safe, and take classes at Super Hero High. These teen titans' story is told in a series of animated shorts, books, and toys. The cartoons debuted in October, and if you haven't watched any of the previous animated shorts, not to worry. There are a total of 13 episodes, and they only run between 90 seconds and three and a half minutes. So catching up will be a breeze. And if you think you need to be a girl to watch them: Nope. Every kid can relate to the challenges these young heroes face. And, bonus, the Flash and Green Lantern show up from time to time. 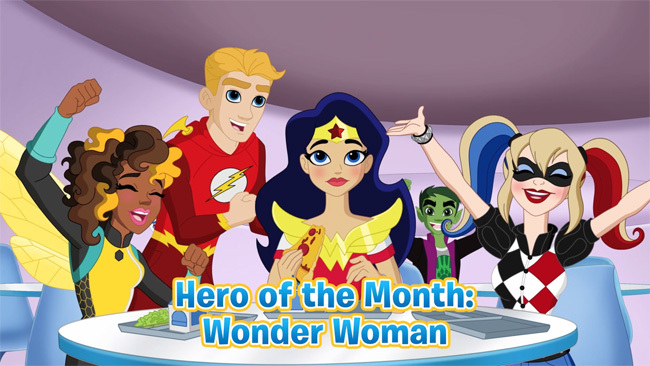 You can watch all the webisodes and dive into the world of Super Hero High on the DC Super Hero Girls website. And be on the lookout for a 44-minute special airing later this spring.